Hi, we're Phin and Rab and this is our blog. We'll keep you up to date with everything that's going on in our lives - including the things that 'mum' would never tell you! Hi. It's far too long since we've been on the computer. Since we last posted we now have a new 'brother' - he's a Border Collie and when he arrived back in February he was smaller than us, but now he's bigger and I think he'll get bigger yet! He's a canny fella although from day one I made sure he knew I'm the oldest and therefore 'in charge' so we have a good understanding. Rab is much softer than me so Cal often drags him round the garden!!! But although Rab is now smaller he can still stand up for himself and they have great play fights. A few weeks ago mum went to Raven River Agility to watch so said I could come for the ride and I ended up having a go - it was great fun. I haven't done any agility for over three years, but quickly remembered most of it! Although mum kept going in the wrong direction - I think its her that needs the training! Hopefully we'll go back again soon. So, what else has been happening? Mum organised a workshop 'Focus and Self Control Workshop' run by Pauline Jackson - I got to take part on the Saturday which was great fun. We did training all day and I earned lots of treats. Been jogging twice this week - 5miles on Thursday, although it is so embarrasing how tired mum looks by the end - I mean we could keep going on for much longer! Hi, I'm Cal and I'm gatecrashing their blog! Although I think I should be a part of it anyway. We went down to the beach today - it was great fun. There were quite a few dogs there but I came back when mum called me and had great fun chasing after Rab and the tennis ball (I'm not quite quick enough yet to catch him, although I did try to shoulder barge him, but he just wasn't letting go!!). Happy New Year. Hope you've all had a great Christmas and New Year. Ours has been good. Firstly we have our New Years Resolution to blog more - we've been very bad in 2012 at keeping up to date. We got lots of lovely presents for Christmas and have been on lots of long muddy walks. We don't mind mud, in fact we quite like splodging through it. The getting cleaned off afterwards is a bit of a pain but its worth it. Since the house was painted we now have to wait outside the front door whilst mum cleans and dries us off. Sometimes she seems to take forever getting herself organised whilst we sit patiently outside. 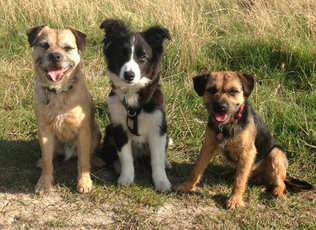 Today we met up with our friend Bobby - he's a border terrier like us too. The other day we met up with Jenny and Harry - they are poodles and we hadn't met them before, but we all got on great and I think we'll see a lot more of them in 2013. Mum is still quite into her get fit mode, which is quite good for us. We hadn't been out jogging for a while, but have been doing 3 to 4 mile 'power walks'. However on Christmas day morning we went for a jog and we are just back from doing 4miles, so hopefully that will continue as we love going jogging. In October mum did the Aviemore 10k and raised £130 for Pets As Therapy - as her training partners Phin and I feel that even though we weren't able to do the actual run we helped her get there. This year she's going to do the half marathon, so we'll have to help out with the training again. Mum has put together a training plan for me and Rab for this coming year which we are looking forward to - I mean who wouldn't look forward to earning hot dogs, chicken and other tasty treats? So, watch this space and we'll tell you about all the new things that we learn.